Take the time out and reward yourself with some great views which provide the perfect vantage point for catching the sunset. Overlooking the peaceful creek and high bushland views that surround the creek will give a relaxing touch to your day. Starting from Barnetts Road carpark you follow the footpath through the picnic area, past the playground then meander gently downhill through the open forest among the scribbly gum trees. 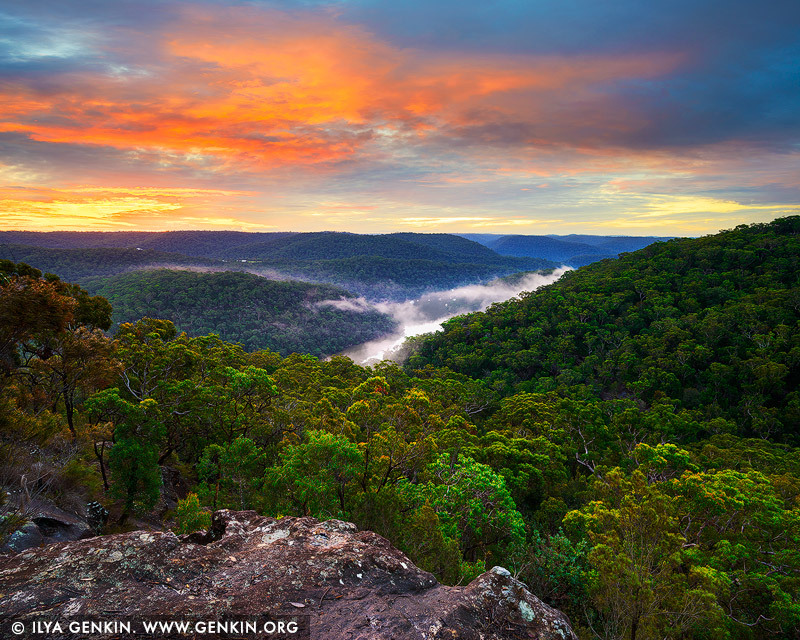 You soon discover a fenced lookout platform with amazing views up and down the Berowra Valley. The views of trees goes on forever, on a clear day you can even see the Blue Mountains. This image belongs to the travel and nature stock photo library. This stock photo of Sunset Barnetts Lookout is available for licensing for commercial and editorial uses including websites, blogs, books, magazines, brochures and advertising. Restrictions may apply for images which contain third party copyrighted material or sensitive subjects. Photos of artwork are for editorial use only. This image id AU-BEROWRA-BARNETTS-LOOKOUT-0001 of Sunset Barnetts Lookout, is copyrighted © by Ilya Genkin. This is not a public domain image.